Are you a lover of the great outdoors? Whether you’re an intrepid adventurer or a dreamy nomad, BESIDE is for you! Far from being focused on celebrity gossip, competition or performance, this Quebec magazine strives instead to give a voice to nature. Throughout its pages, we find editorial content on the outdoors, social reflections and recreational travel stories that are addressed to this community of people who see the trees of a forest, the bends of a river or the summit of a mountain, as a playground with infinite possibilities. The magazine is published twice a year and contains more than 100 pages of content. Proud of its roots in Québec, it is written individually in English (where it appears under the name BESIDE) and in French where you can feel the experiences of the wild spaces at the heart of the written pieces. Beyond their desire to write articles about sustainable outdoor activities, BESIDE is committed to taking concrete actions to protect the environment. For each copy sold, a donation of $ 1 will be donated to a charity dedicated to the preservation of nature, including the Outdoor Foundation and PurNat. 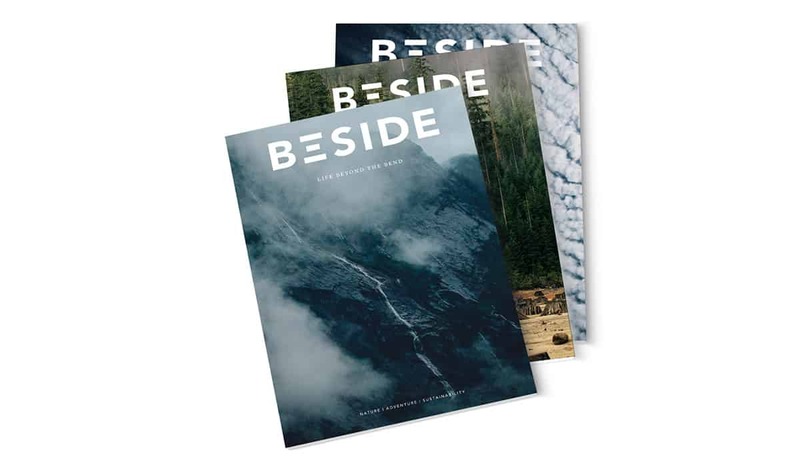 In the end, BESIDE wishes to offer high-quality content focused on a rediscovery of nature respecting the environment, in order to play outside as often as possible. There is 2 thoughts on this article titled “Discover the Canadian Outdoor Magazine, BESIDE”. Could you send me your advertising rate sheet? I have a client that manufacturers canoes and I would like to suggest your magazine to advertise in. Many thanks.